I adore Indian food. 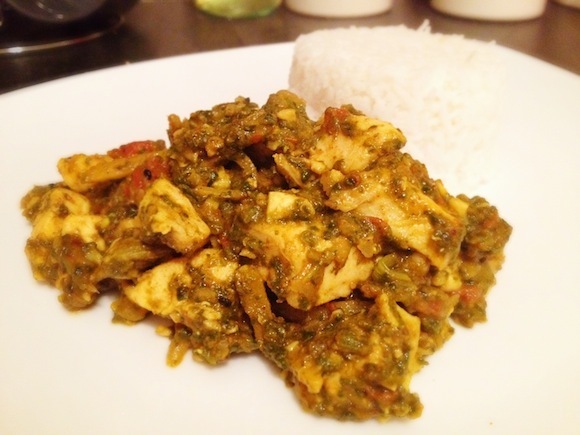 Chicken Saag being my all time favourite thing to eat & cook! It’s quick to make, tastes amazing & you can never go wrong with it… unless you don’t know how to fry. The beauty of this recipe is that you are in control with how much spinach you add and how hot you want to make it. Personally, I like it spicy with a big bunch of spinach. Customise it how you wish! I serve mine with steamed basmati rice, garlic naan bread & a big helping of mango chutney for added sweetness. Perfect! 1. Put the spinach into a deep pan. Add 1/2 cup of water and cover. Bring to a boil and remove from the heat. When cool, puree the spinach in a food processor or blender and set aside. 2. Heat the oil in a large pan. Fry the chicken for 3 to 4 minutes, until lightly browned. Remove the chicken from the pan and set aside. 3. Heat the remaining oil in the skillet and add the ginger, garlic and onions and fry until lightly brown. Add the tomatoes, salt, cayenne, ground coriander, turmeric, cloves, and cardamom. Sprinkle with 1 tablespoon of water. Cook for 10 minutes over a low heat. Add the chicken and milk to the pan and simmer until the chicken is tender and cooked fully, about 10 to 15 minutes. 4. Add the spinach puree and garam masala to the pan. Cook, stirring frequently, until the spinach starts sticking to the pan, about 5 minutes. Remove the pan from the heat and stir in the butter. Serve with rice or naan bread.